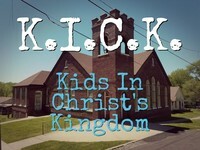 Kids In Christ's Kingdom (K.I.C.K.) will be held Thursday nights from 5:30 to 7:15pm at Rushville Christian Church. K.I.C.K. is a weekly summer Bible program designed for students entering 2nd through 6th grade in the fall. K.I.C.K. is held over the summer from May through August. Kids will get the opportunity to run off some energy with a planned physical activity, enjoy a meal, and learn about the bible all while having FUN!